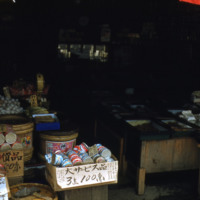 At the far end of a long row of stands holding fish, a man places fish on the last stand. 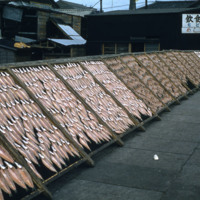 A row of wooden racks support a large number of mackerel drying in the sun. 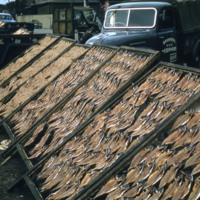 These trays of fish are for sale in a local store or stall. 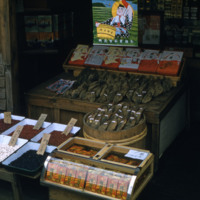 A food vendor's stall displays a variety of edible items available for purchase. 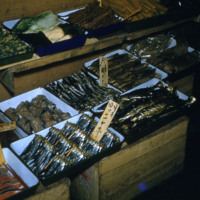 The stall of a food vendor showcases some fish, a variety of beans, and other items. 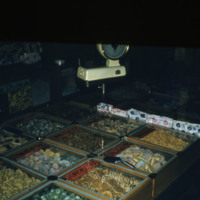 A table of bins of food, scoops and a scale near, offers shoppers a wide variety of choice. 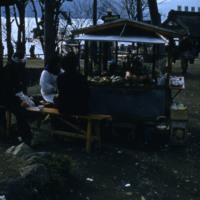 Several people sit on a bench in front of a food stand with Lake Chuzenji and mountains in the background. 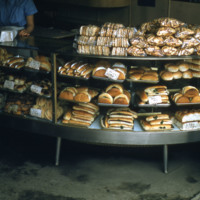 A woman pays for her purchase at a counter full of baked goods exhibited for sale. 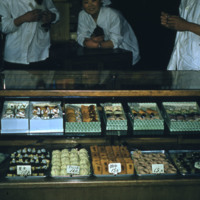 Three bakers converse behind a glass counter filled with kimishigure and yokan, among other confectionions. 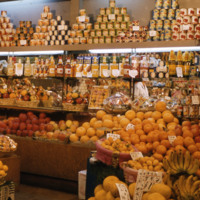 A shop sells a myriad of fresh and canned fruits and vegetables. 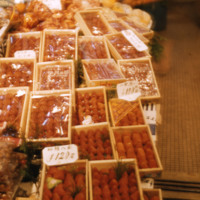 Packages of berries for sale covers a display table. 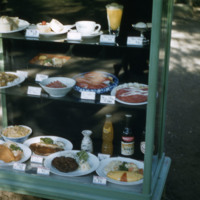 A restaurant display case shows a wide sample of food items. 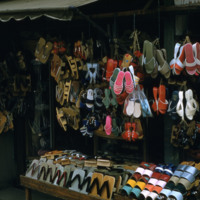 A booth displays a large array of shoes, including traditional geta clogs. 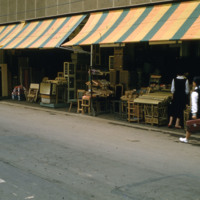 Open awnings of a furniture store face onto a street. 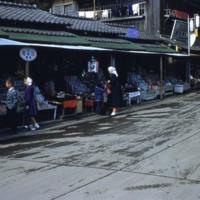 A row of merchant stalls lines a street. 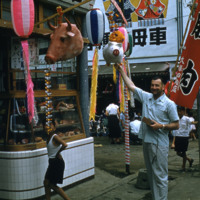 A man and child pose in front of a colorfully decorated butcher shop.